Figure A. PE-Alexa Fluor750 conjugated mouse anti human CD3 (MCA463P750) and Alexa Fluor647 conjugated mouse IgG1 isotype control (MCA928A647). Figure B. PE-Alexa Fluor750 conjugated mouse anti human CD3 (MCA463P750) and Alexa Fluor647 conjugated mouse anti human CD49d (MCA2503A647). All experiments performed on red cell lysed human blood gated on lymphocytes in the presence of Human Seroblock (BUF070A). Data acquired on the ZE5™ cell analyzer. Figure A. Alexa Fluor700 conjugated mouse anti human CD3 (MCA463A700) and RPE conjugated mouse IgG1 isotype control (MCA928PE). Figure B. Alexa Fluor700 conjugated mouse anti human CD3 (MCA463A700) and RPE conjugated mouse anti human CD49d (MCA2503PE). 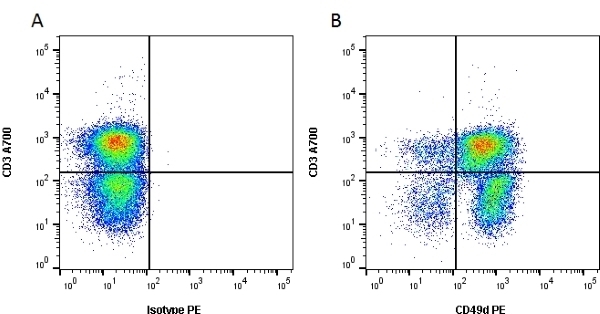 All experiments performed on red cell lysed human blood gated on lymphocytes in the presence of Human Seroblock (BUF070A) acquired on the ZE5™ cell analyzer. Mouse anti Human CD49d monoclonal antibody, clone Bu49 recognizes human CD49d, also known as integrin alpha 4 or VLA-4 alpha subunit. CD49d is a ~150 kDa single pass type I transmembrane glycoprotein. CD49d can be proteolytically cleaved to yield fragments of ~80 and ~70 kDa (Hemler et al. 1987). CD49d associates with either CD29 to form VLA-4 or with Integrin beta-7 to form The Peyer's patches-specific homing receptor LPAM-1, involved in the lymphocyte migration and homing to gut-associated lymphoid tissue (Sackstein 2006) through its interaction with MadCam-1, preferentially expressed on Peyer's patch high endothelial venules and postcapillary venules in lamina propria (Briskin et al. 1997). CD49d is expressed on a broad range of cells including lymphocytes, monocytes, eosinophils and thymocytes. CD49d expression may serve as a prognostic parker of survival and disease progression in patients with chronic lymphocytic leukemia and may have therapeutic potential (Bulian et al. 2008). Mouse anti human CD49, clone Bu49 cross-reacts with the canine B-cell leukemia cell line GL-1 and induces homotypic cell aggregation (Ikewaki et al. 2010). For best results Bio-Rad recommend HISTAR detection kits. Oxford University Press. (1995) Leucocyte Typing V. White cell differentiation antigens. Ikewaki, N. et al. 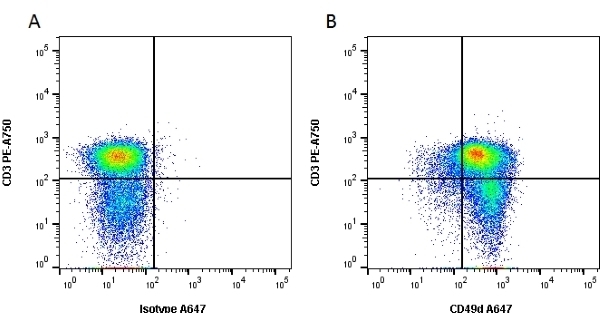 (2010) Anti-human very late antigen-alpha4 (CD49d) monoclonal antibody (BU49) cross-reacts with the canine B-cell leukemia cell line GL-1, resulting in the induction of homotypic cell aggregation. Hamilton, E. et al. (2012) Mimicking the tumour microenvironment: three different co-culture systems induce a similar phenotype but distinct proliferative signals in primary chronic lymphocytic leukaemia cells. Br J Haematol. 158: 589-99.